A couple of weeks ago I made some homemade suet cakes with our accumulated fat drippings from a year’s worth of cooking. We put the first one out a few days ago, and while it took a day for the birds to discover it was there, once they did it’s been a hit. 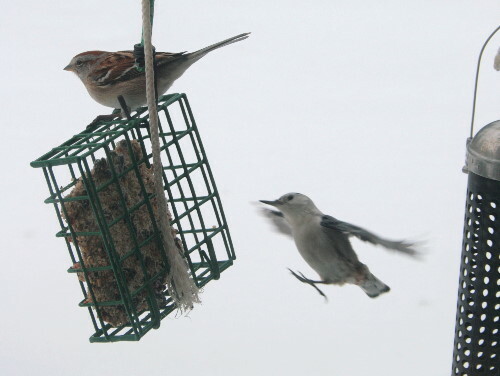 I’ve seen all of our regular pecker-style feeders there – the chickadees, of course, as well as the Downy Woodpecker and both White- and Red-breasted Nuthatches. Who I didn’t expect to see eating it, mostly due to its presentation format, were the American Tree Sparrows. If the chickadees have been fans, and the White-breasted Nuthatches huge fans, then the American Tree Sparrows are Huge Fans. 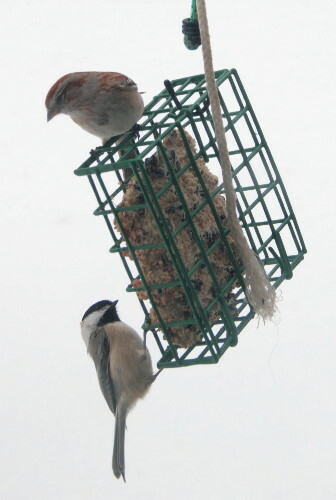 There are greater odds of glancing out the window to see a tree sparrow on the suet than there are of catching a chickadee on it, it seems. I’m not used to seeing ground feeders on suet cages, so every time I see them there it feels like a surprise. But it shouldn’t be too much of a surprise. In the winter months, it can often be a struggle just for a bird to get enough energy to make it through to the next day. Thermoregulation in cold temperatures comes at great metabolic cost. Sunflower seeds are one of the favourites at bird feeding stations because they have among the best reward:effort ratio – the highest fat content for the size of the seed and the trouble it takes to open it. Even better than sunflower seeds, though, is suet. 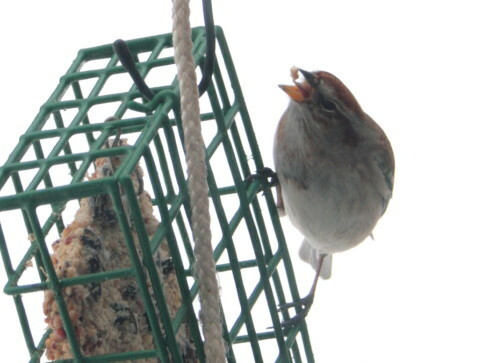 Suet, in its most basic form, is pure fat. It’s hard to find something more energetically rewarding than that. 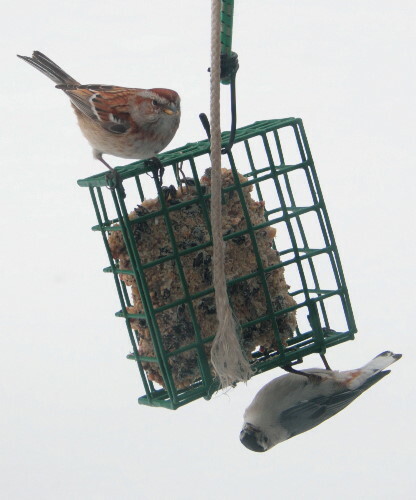 Suet can be put out for the birds just as it is, but it’s common for it to be mixed in with other ingredients. These, in theory, make it more nutritious and/or tasty to the birds. Or perhaps it just makes it seem more appealing to our human palates. 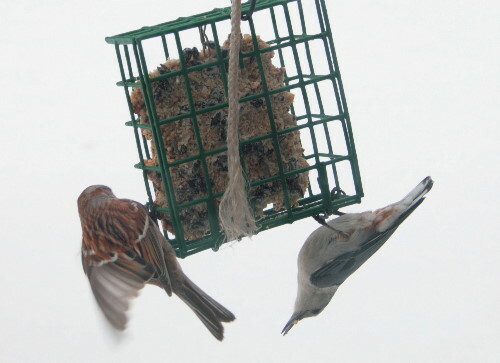 Common ingredients mixed in to suet are peanut butter and/or peanuts, birdseed, and cornmeal. Julie Zickefoose has hit upon a suet-based recipe that’s so popular among her birds, and so famed around the blogosphere, it’s colloquially been labeled “Zick Dough“. Julie uses suet/lard, peanut butter, cornmeal, quick oats and flour in a 1:1:2:2:1 ratio. The resulting product resembles shortbread or peanut butter cookie dough. I tried it out once, but either our birds didn’t go for it, or they just didn’t find it very quickly, and it received only moderate traffic. Meanwhile, I found it a little messy to handle and set out (though I’m sure there are ways around that, such as packaging into individual-serving containers). Edit: Commenter Ruth reminded me that Julie had added a note about her suet dough on her blog a short while after the post that I linked to. In somewhat coincidental timing, she also posted about it again today (March 7). It seems her bluebirds – and those of others, it turns out – will become “addicted” to the high-fat, high-carb mix, eating it and very little else while the suet dough is available. This diet with poor nutritional value leads to bad things like gout or metabolic bone disease. So far, in all the posts I’ve seen her discuss it, it seems to be something restricted to bluebirds – the other species have enough sense to vary up their diet, I guess. Also, it’s more likely to be a problem in the summer than in the winter, it appears, though can and does occur at any time of year. Julie’s solution, which she learned through another website that had been discussing suet doughs, was to add unmedicated chick starter to the suet. That is, the grain stuff that you can buy from agricultural feed stores for the purpose of growing chicks into chickens. And the unmedicated stuff, that doesn’t have antibiotics, etc, added. This chick starter is well-balanced for proper nutrition for growing chicks, and so has appropriate levels of vitamins/minerals/nutrients and the proper proteins that a bird should be getting for good health. Julie’s new recipe is suet/lard, peanut butter, cornmeal, quick oats, flour and chick starter, in a ratio of 1:1:1:2:1:2. You can read the whole story at the post over at Julie’s blog. In preparing my collected fat drippings into something appropriate for the birds, I wanted an end result that could be tucked into our suet cage with minimum mess or fuss (now, admittedly, it’s Dan who takes care of all the bird-feeding chores, but out of consideration I wanted it to be easy for him to put out). I felt suet cakes, rather than dough, were more appropriate to our arrangements here, which required a modification of the recipe. The ingredients weren’t all that different, I just changed out the flour and replaced it with birdseed. I used suet/fat/lard, peanut butter, cornmeal, quick oats and birdseed in an approximately 3:1:1:2:4 ratio. Roughly. I didn’t actually measure at the time, I just melted down the fat and peanut butter and then poured stuff in till I reached the consistency I wanted, which was more of a thick slurry than an actual dough. Think the consistency of breakfast oatmeal, perhaps. I poured this into plastic lunch containers (the square ones designed for sandwiches), which were the perfect size to fit into our suet cage. Then I put them into the freezer to solidify. When it was time to put one out, Dan could run a knife around the outside and pop it out. Any container would do, though, as long as the resulting cake was the size you wanted or needed. It might also be necessary to line/grease/flour the container to make getting the cake out easier. Edit: Commenters brought to my attention that cooking fat may contain dioxines which are bad for the birds, so while the birds will probably not be eating giant quantities of suet, it may just be best to use something that hasn’t been cooked with. Also that hot suet poured into plastic containers may leach into the cake, unless you use BPA-free containers. If you have glass, that might be a better option. I posted something to my Facebook page mentioning the tree sparrows on the suet cakes, and had an interesting conversation with a couple of folks there. The first, one of British Columbia’s most esteemed naturalists, mentioned that his father, and now he, makes suet cakes using suet, peanut butter and cornmeal in a ratio of 2:1:1 and freezing it in the appropriate sizes. Apparently his birds are nuts about it. Another friend, also from BC, interestingly, said she makes hers with fat, water, sugar and cornmeal in a 2:2:1:2 ratio, bringing the first three to a rolling boil before adding the cornmeal, and then throws in hulled sunflower seeds, currents, oatmeal or whatever seeds or nuts she might have handy. They both had interesting comments. The first said his son had done a science experiment when young to see what sort of suet birds like best. Although the details of the project are now lost to time, he recalled that chickadees and nuthatches preferred suet cakes with peanut butter, while Downy Woodpeckers liked it plain, and nobody much liked it with seeds or fruit in it if they had a choice of one without. The second indicated that she picked up her fat from the grocery store for free, from their waste trimmings, which I thought was a very useful tip. She also said she didn’t use peanut butter because she had been told it can potentially cause fungus to grow in the crops of birds. I hadn’t ever heard anything negative about peanut butter, and it worried me a bit because I did put it in my cakes, so I did some poking about the ‘net to see what I could turn up. Peanut butter, it seems, receives quite a bit of concern from bird-feeders. One is that the sticky texture might cause birds to choke as they try to eat it, but there has been apparently no evidence to back up this concern. Another is that it might clog their nostrils, but again, no evidence, and I personally think birds are smarter than this anyway. Another was regarding the sugar and preservatives in peanut butter, but these have also not been shown to have any adverse affects on birds (just as they don’t in people). I had a lot of trouble finding any mention of fungus in peanut butter, but finally turned up this page. Apparently the same fungus that can grow in stored peanuts when they’re left in humid places too long can also be found in peanut butter. The risk of contamination in peanut butter is significantly lower than in stored peanuts, however, and the sooner the peanuts are processed after being harvested, the lower the risk of any mold occurring in the peanut butter. The author points out that in this way store-brand peanut butter is actually safer than that made by natural food stores, as many of the latter store the peanuts and then grind them fresh in-store, leading to documented higher levels of the toxins in the peanut butter. All that said – I think as long as you buy commercial peanut butter, there’s no more risk to the birds than there would be to you. If you feel safe eating it, then it should also be fine for your birds. And the birds sure love it. Well, you certainly have more control over the ingredients, Barbara! I must admit I haven’t ever read the ingredients on a storebought suet cake. I always store my peanut butter in the fridge. And when i run out of suet cakes and don’t feel like running to my local supplier, I make my own from unflavored gelatin. You just heat it on the stove til the gelatin powder dissolves; it acts as the glue holding the cake together. You can then mix in whatever you like. I add in mostly sunflower seeds, cracked corn, raisins and whatever I have around that seems tasty. 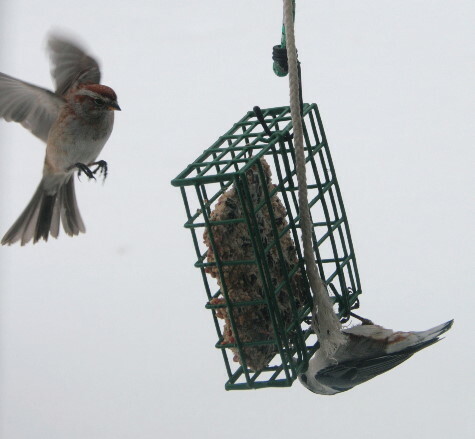 Perhaps gelatin cakes are not the energy powerhouses honest to goodness suet is, but they still go after it like crazy. There’s also no risk of it going rancid in warm weather. Now that’s an interesting idea with the gelatin, Fern. I would never have thought of that. It’s a great alternative for summer-weather cakes. Thanks, Karen! I enjoy feeding the birds, both for my own pleasure in watching them, and for the opportunity to perhaps give back a little to nature when we as humans do so much taking away. We often crumble suet and leave the bits on the porch railings. It’s surprising how much the cardinals will eat when it’s served this way. 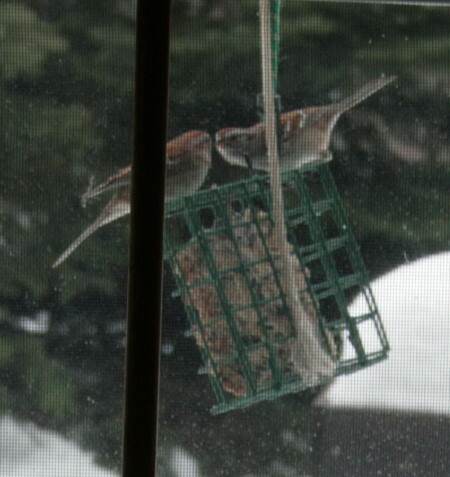 I didn’t realize they were suet fiends. If I wasn’t worried about squirrels making off with it all – and if we had porch railings – I’d enjoy offering suet that way, too, Joy. There are a number of species that would be likely to partake of it if it were served in a manner they could easily get at. That’s the down side of the suet cage, it’s pretty much restricted to the clingers and the occasional innovative percher. Julie wrote an interesting post about her Zick dough six months after the link you posted. I stopped making it after that. We get suet from a Mennonite butcher and I mix bird seed into it and hang it from the nylon net bags we get produce in. Sometimes I spread peanut butter on a branch and this is very popular. That’s a great source of suet, too. I’m going to need to start inquiring of our local butchers to see if I could get some anywhere. Julie added another chapter to the Saga of the Suet Dough today, as I expect you may have seen but I’ll add here just in case. Once again, her post seems to reiterate that the problem is primarily with bluebirds, and primarily in the summer. However, just to be on the safe side, she’s modified her recipe to include a slightly more nutritious additive. Her blog post here. 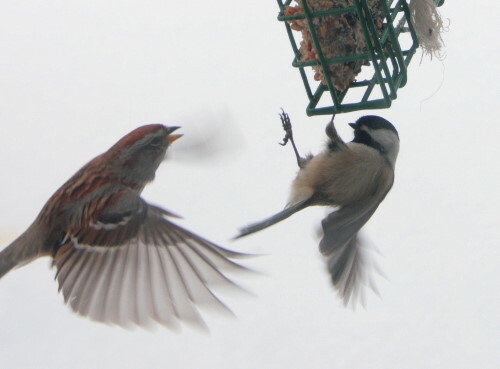 great article on suet and recipes.. I have to say..the only concern I have about your recipe..is that if you put your mixture into the plastic containers to mold while hot..the plastic may leach into the mixture.. I would instead use glass. Ah, that’s a good point, Dawn, I hadn’t thought of that. The mixture had cooled a bit by the time I’d poured it, but it’s definitely something to pay attention to next time I’m making it. Maybe I could pour it into my casserole dish and just cut it into squares once it’s solidified, and then put those in containers into the freezer. I wonder if that’s safe to do? I mean… There are dioxines in used cooking fat, and you certainly don’t want them to enter the food-chain, where it will accumulate somewhere on a higher level. Thanks for pointing that out, Anne. I wasn’t aware that there was anything harmful in cooking fat. I like the ideas a few people have mentioned about getting suet from the butcher. Presumably you could then ask him (or her) how it’s prepared, too. In Belgium, there was a huge scandal a few years ago, the so-called ‘dioxine chickens’. A manufacturer of chicken-food (and other animal-foods) had used large amounts of used frying-fat. The chickens (and their eggs) who eat that food had a far too high dioxine-content, and had to be destroyed. Ah, that makes sense, Anne. I wonder if part of the problem was that that was the chickens’ sole diet, so it built up in their systems. Still, better safe than sorry; but what to do with all that cooking fat, now? In Belgium it is collected as ‘small quantitay chemical waste’ (‘klein chemisch afval’) and is processed in specialised waste processing installations. In Belgium it is collected as ‘small quantity chemical waste’ (‘klein chemisch afval’) and is processed in specialised waste processing installations. Hi – thanks for the post. I never know what I will come across when I scroll these blogs. But just wanted to let you know I really liked yours. Keep it up. Hi, I enjoy your blog. Is there something I can do to obtain updates like a subscription or some thing? I’m sorry I’m not familiar with RSS? Seo wants a good search engine optimizer plan. Just one among these methods could make an enormous distinction in your sites position and firm your web site brings you.